Garden Report - Bark Like A Fish, Damnit! Well, we finally got three days of rain, which is good because the ground was bone dry, even if the air continued to be a sauna. Most Valuable Non-Native Player is usually Walker's Low catmint, an unspeakably durable non-reseeding perennial, but this year it's getting a run for its money from a tropical annual cuphea, which is still flowering even now, and the Japanese salvia, Koyame, which is a late flowering part-shade salvia. Both very attractive to bumblebees, although the cuphea is also bringing in small pollinator wasps. Not doing as well are the lion's ear and the black-and-blue salvia. The lion's ear is an annual here, and reasonably attractive to hummingbirds, but so are a lot of other things that aren't as floppy and picky. The black-and-blue is very vigorous (wildly vigorous) on a dry slope but I think would do better if I cut it back about once a month. Hummingbirds like it, too, but nothing else seems to care that much. The fig has lost its mind and I'm gonna have to take after it with a saw once I've harvested all the figs. It went from a stub to a roaring green giant that's approaching the second story. Can't say that the swamp milkweed is thrilling me. I grow milkweed because I hope for monarchs, but I've never had a caterpillar and the plants...ah...do not hold up well to the weather. Limp, brown, dead and aphid riddled, with moldy seed pods. I'll keep growing it, of course, because someday a monarch will wander in, but I may move it to a low traffic zone, because at the moment it looks like something you'd find in the bottom of the veggie crisper four months after the CSA ended. This leads us to the problem of soup beans, yet again. "Leave the beans to dry on the vine," suggest the various books, written mostly by people who do not live in the South. This is how you're supposed to harvest the seeds for next year, too. Har har. One year in three, maybe, I get that option. The rest of the time, in late summer/early fall, the bean pod turns into a thin, moldy tissue over the beans, and the ones I don't get to fast enough actually sprout inside the pod from the moisture, so you get little white snouts poking out of the bean pods. They are not going to dry on the vine. They are not going to dry anywhere, except inside the house. Autumn is the season of mold here. So now my ideal bean is short season, heat and humidity tolerant, vigorous and mildew-resistant. The astonishing thing is that I've got at least three that fit that bill. Beans are a remarkably gracious plant. I've harvested enough beans to make soup and chili a couple times this fall, and next year the hard part will be finding room for all the new varieties I'm experimenting with. I'm visiting friends in Fargo and today we went for a walk in the Buffalo River State Park in MN. We saw some Monarchs happily fluttering around some wild thistle and my friend says they and other creatures like that. I wonder if that could grow where you are and attract any Monarchs in the neighborhood? I love seeing your garden reports. I can't keep a garden alive (patio only + laziness + 100 and up dry heat = ded) but it's fun to hear about other people's gardens and live vicariously. In my yard it's tomatillos that are throwing up the late blossoms. Totally covered in bumblebees. It's pretty fantastic, even if the plants are basically sprawled across the entire walkway to the back gate. Our weather (SE Wisconsin) has been so weird that my strawberries, which are normally done for the year in July, just started blooming again. If they actually set any fruit the frosts will knacker it before it can ripen. 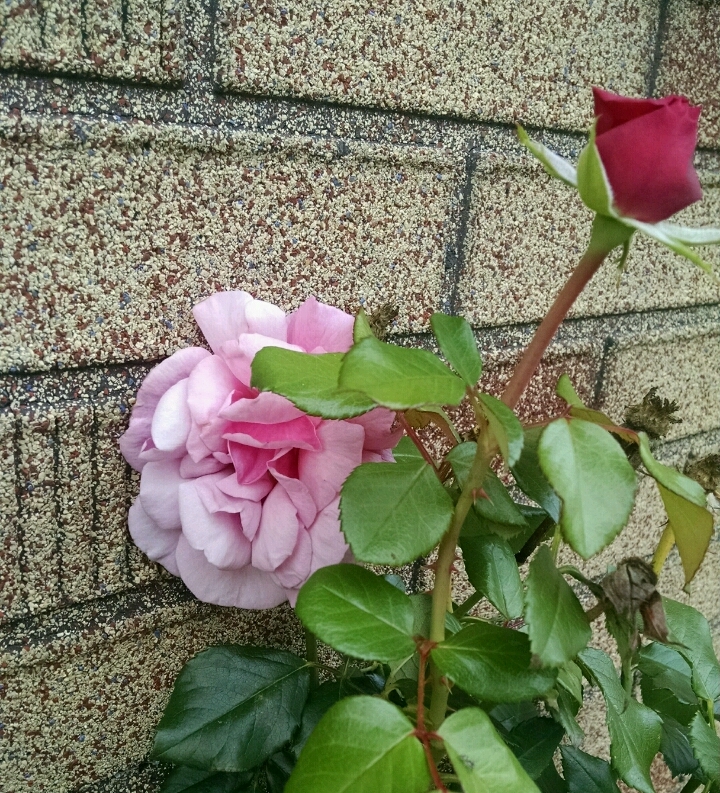 But the last rose of Autumn is gracing the Driveway Guardian on schedule, which pleases me. And the tomatoes will be done soon, with several cups of diced summer safely tucked into the freezer. For having largely ignored the garden this year, I'm content. Except for yanking things out of my Dad's backyard when they threaten to take over the world, and I am on my way to the bird feeder, it's too damned hot for me to do anything out doors. Hooray for your gardens! I got books signed and got to talk to Jacqueline Carey and Cat Valente this weekend. Hugo's and your name were mentioned. The trendy foodie shops and blogs I know (including, let's be honest, my own) are all about flour from sprouted grains at the moment, which causeth me to wonder: is there any virtue, I wonder, in sprouted beans...? Bean sprouts have a long history of being part of the American Oriental (rather than authentic Asian) cuisine. They are also quintessential hippie food. I think, however, that mold-coated beans sprouting in the pod on the plant might be considered going too far. As an """authentic Asian""", what the heck are you talking about? Chinese cuisine uses at least two different kinds of bean sprouts, douya and doumiao (the latter specifically referring to the baby ones, not the leaves off vines). For some reason, I am reminded of the joke with the punchline "Well, we really need the eggs." And now I'm thinking about a village that has to cope with Mad Roaring Green Giant Fig Shenanigans (no doubt the result of either a curse or an unforeseen-consequences sort of blessing), which are tolerated because in the end the actual Mad Roaring Green Giant fig fruits are plentiful and tasty and have become an important part of the village's economy. The Mad Roaring Green Giant Fig harvest itself is a task that requires dexterity, sharp reflexes, and/or padding/armour; plenty of excitement for all the local village gardening badasses! And . . . so on and so forth. I can come up with the ideas, but I'm hopeless at actually following up and writing anything. And it really feels like a UrsulaVernonesque sort of thing anyway. "Oh, the usual. Fig-Bob's been terrorizing my bull again, and tore a swath through the turnip field." I've been throwing myself against the brick wall of No Figs for years. If it's in the ground, either the moles or deer get it or it drowns (the sunny area is next to the stream, which does flood the lower half of the yard not infrequently). In a pot on the deck (advantage: no deer) it just fails to thrive. So, not so much Ursula and the Beanstalk but Ursula and the Fig. Doesn't have the same ring to it but it sounds like the Fig Giant is climbing the house like a verdant King Kong. Milkweed is just... hard in gardens, I think. We completely lost our common milkweed in the pollinator garden at work, aphids just destroyed it. I can't figure out how monarchs actually succeed as a species - either the milkweed bombs, they have about 8 billion viruses and fungi that they can pick up as caterpillars, sometimes they never manage to cocoon right, they get the tar beat out of them as adults, and sometimes you get weird little caterpillars that just wander right off the plant and die. This is all BEFORE the human caused problems. If it makes you feel any better, the migration numbers this year have been a LOT better - at least out here in KS. We may actually manage to use up all 500 monarch watch tags we ordered. Wow- Milkweed here is actually a weed. It just grows, randomly where it will. Flourishes. I don't think we get monarchs, but the plant is here, ready and waiting, We never weed it out. It doesn't over grow anything. Colorado. Also in Colorado, but this year my milkweed would sometimes die from a mysterious aliment. I did not plant it and I am not trying to get rid of it, but it is not happy in my Denver yard. It was perfectly happy last year. No humidity, but it looks like some sort of rust or mold is attacking it. Watch out when you prune the fig - fig sap contains natural latex, which is photo reactive, and if you get a lot of it on your skin, and then expose your skin to sunlight, you can end up with horrible blistered burns. This happened to my brother, and it seems like just the kind of weird gardening accident that would happen to you, so I just thought I'd pass the information along. I planted my Swamp Milkweed at the end of a downspout. It still didn't live long. I have much better luck with Common Milkweed and Honeyvine Milkweed, both of which get me Monarch and Milkweed Tussock caterpillars. Which reminds me irresistably of my garrulous four-year-old child vs. the poor beleaguered census man way back when. She wandered in just in time to hear me tell him "...two adults and one child" and picked up with "And we have two cats, Bo and Livingston, and in the front yard we have a crocus and in the back yard we have bamboo. I don't want to cut the bamboo because a panda might come from China and eat it." ...it should come as no surprise that she has grown up to adore your books. Reading bean advice in the south is much like reading leaf advice in the Northwest. "Wait until all the leaves are down and dried, then mow them with a mulching mower" they say. "Down and dry?" I ask, repeating myself over and over again. The two words do not go together in my head. I can't make them fit.